Hello reader! Welcome to this week’s edition of our Redscroll blog post. We have a bunch of exciting show announcements this week! 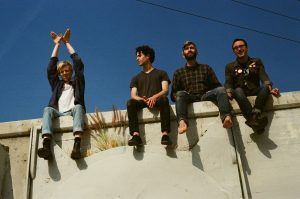 Just announced at Space Ballroom we have local Grateful Dead Tribute group Shakedown (11/21) and Ontario indie rockers, Tokyo Police Club (3/9/19). As a part of our weekly emerging artists series Manic Mondays at Cafe Nine, we have Brooklyn-based project, Elizabeth and the Catapult (11/19) who recently opened for Sister Hazel. 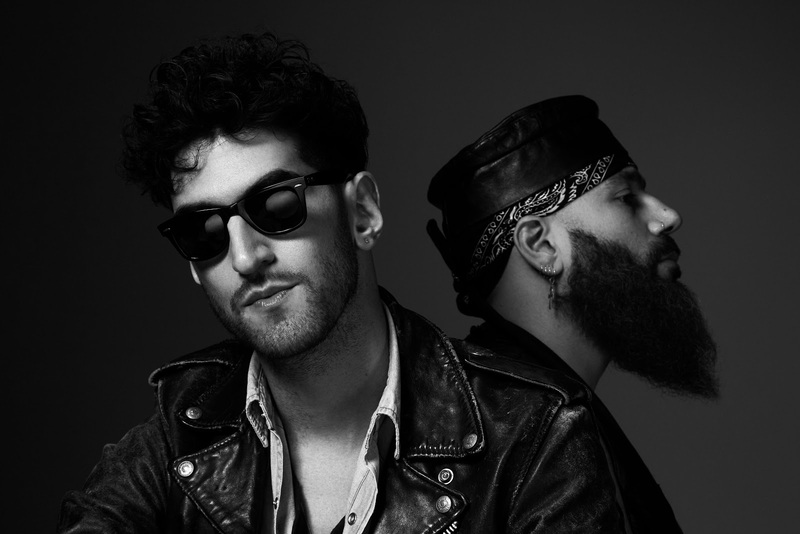 We have a packed Indigenous Peoples Day weekend starting tonight with electro-funk duo Chromeo (10/4) at College Street Music Hall and indie/shoegaze group Swirlies at Space Ballroom. 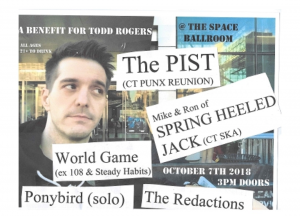 The weekend fun continues Friday (10/5) with Start Making Sense: Talking Heads Tribute; Saturday (10/6) Dressy Bessy w/ local rock group The Foresters; and Sunday (10/7) Todd Rogers Benefit featuring The Pist, Spring Heeled Jack, and more!! 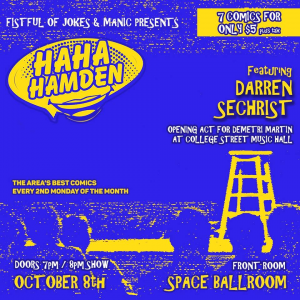 Monday (10/8) holds a triple header of shows including Ray LaMontagne at College Street Music Hall (tickets going fast), Ha Ha Hamden Comedy Night at Space Ballroom (Front Room) and A Hawk and A Hacksaw (ft. Jeremy Barnes of Neutral Milk Hotel) w/ Elison Jackson at Cafe Nine as a part of a weekly Manic Mondays music series. CONTEST TIME! 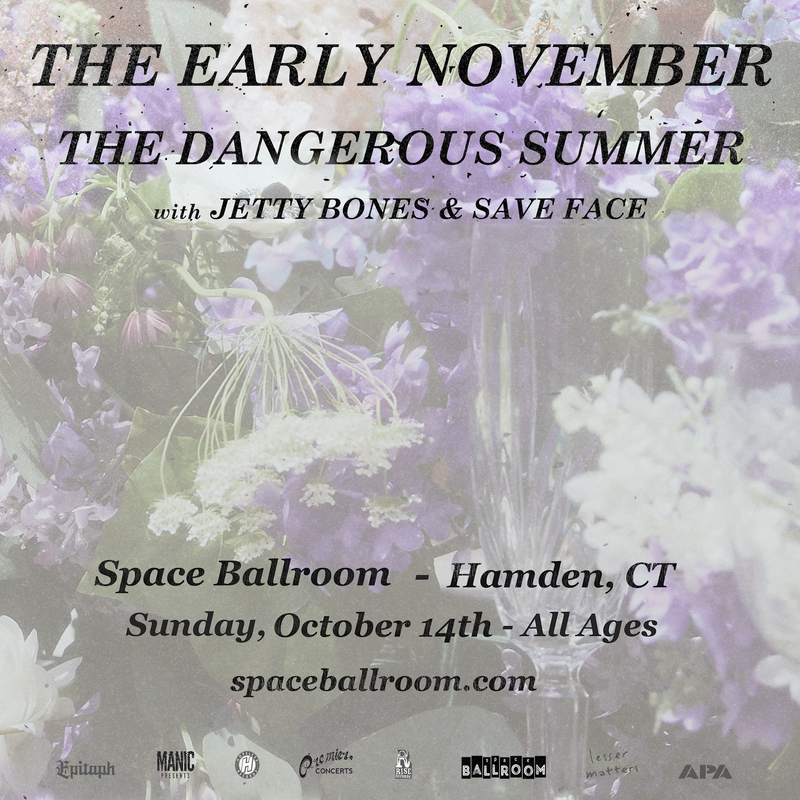 Enter for a chance to win a pair of tickets to see The Early November & The Dangerous Summer at Space Ballroom (10/14) with special guests Jett Bones and Save Face. Along with the tickets you’ll also have the option to choose one merch item from The Early November. INFO: Chromeo is Dave One and Pee Thugg, also known as David Macklovitch and Patrick Gemayel. Two best friends that have been doing music together since they were kids. 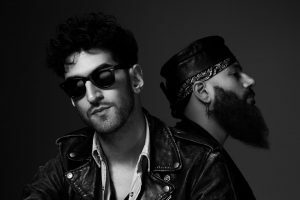 Before establishing themselves as a band, Chromeo were making beats for well-known Québec hip-hop acts such as Shades Of Culture, Dubmatique, Sans Pression and Yvon Krevé. In the summer of 2000, Tiga, a fan of Obscure Disorder, stepped to Dave and asked him if he was interested to do an electronic music project on Turbo. In 2001 were signed by Turbo when they finally put together a demo. With Chromeo, expect to hear a lot of analog synths, rock guitars, 808’s, rhodes and talk box. INFO: Formed from the shell of a Go-Go’s cover band named Raspberry Bang (featuring the inimitable Rusty Nails), SWIRLIES began their life in Boston/Cambridge, MA in the summer of 1990. The original band featured Damon Tutunjian (guitar/vox), Seana Carmody (guitar/vox), Andy Bernick (bass), and Ben Drucker (drums). SWIRLIES played live for the very first time on 25 January 1991 at the Alcove in Allston, MA. In these early years, SWIRLIES wandered the Northeastern Megalopolis with other like-minded folks, releasing 7″ records through the kindness of Slumberland, Pop Narcotic, Cinderblock, and other labels. Billy Ruane was there. 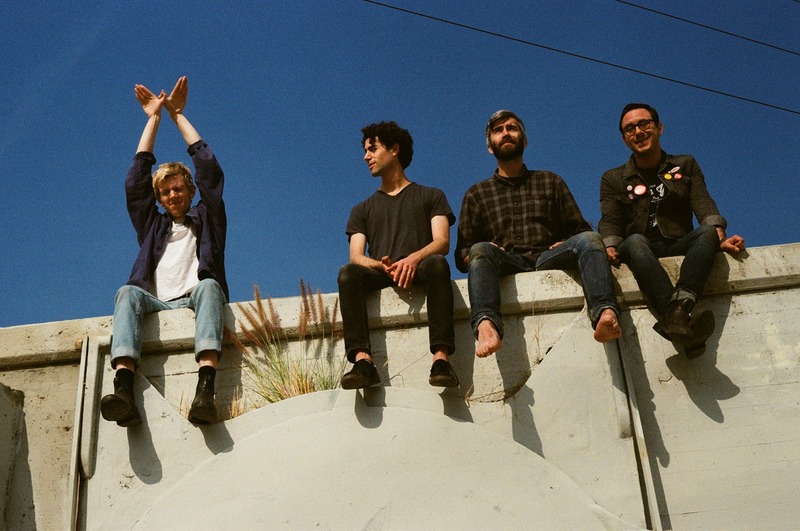 And then SWIRLIES signed to the ‘local’ label Taang! Records in 1992. 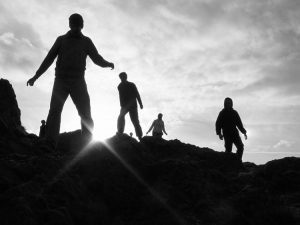 Our first two releases, the ’What to Do About Them’ EP (a collection of previous 7″s and new tracks) and ‘Blondertongue Audiobaton’ LP, were created and recorded by an amalgamation of the original members and other mysterious entities. After school ended for the season, Andy returned to join Morgan and the band. Thus, SWIRLIES explored the sensual realm known exclusively to bands with two bass players. Photo of the Swirlies in 2003Some examples of recent activity, also known as Grim Death Throes: 1) SNEAKY FLUTE EMPIRE, our special alter-ur-label with cassette and CD releases; 2) THE YES GIRLS, a sneaky-flute-music-playing group featuring Damon and occasionally some combination of Rob Laakso, Andy Bernick, and Ron Rege; 3) RICHMOND COUNTY ARCHIVES, a label with various tangential releases 4) SWIRLIES’ MAGIC STROP, a series of old SWIRLIES sounds offered as free web releases on this very site. INFO: Start Making Sense are selling out rooms throughout the eastern half of the United States. 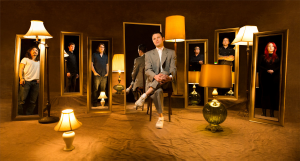 This band is a huge hit as the Talking Heads are never on tour, and the band’s amazing dedication to the music and fun loving attitude has proven to be a favorite at clubs and festivals. INFO: “We never broke up,” Dressy Bessy singer/guitarist Tammy Ealom says on the occasion of the release of KINGSIZED, her band’s first new album in seven years. “It was never our intention to drop out, it just sort of happened. We were dealing with life, but we never stopped making music.” Indeed, the 13-song KINGSIZED makes it clear that, nearly 20 years into their career, Dressy Bessy are making some of their most compelling and accomplished music. 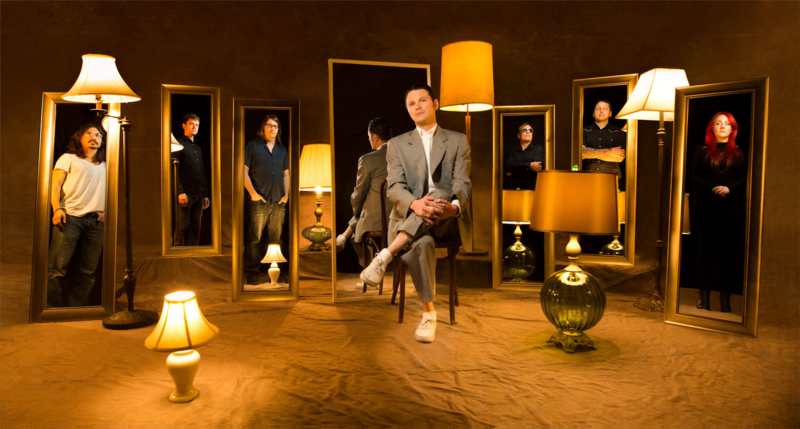 Such melodically infectious, lyrically barbed new tunes as “Lady Liberty,” “Make Mine Violet” and the anthemic title track are potent examples of the band’s uncanny ability to wrap Ealom’s personally-charged, pointedly subversive lyrics in sparkling, irresistibly catchy songcraft. INFO: Every scene has unsung heroes who spend their lives contributing to that what has brought us all together. Todd Rogers is such a person. As frontman of prolific CT punk act Boiling Man, to working at the legendary Tune Inn and painting their iconic sign, to spending 15 years as art director for Asbestos Records (as well as designing albums, shirts and websites for dozens of other CT bands, labels, record stores, coffee shops, and dozens of posters for Manic Presents. Todd recently suffered from a debilitating condition that led to having emergency surgery to remove and replace 4 discs from his spine. Even after insurance coverage, the operation and subsequent rehab ran tens of thousands of dollars out of pocket, and Todd will have to spend months of recovery to get back to his art. Asbestos Records & Manic Presents are hosting this show to help Todd get back on his feet. Tickets available on a sliding scale, and any additional donations are greatly appreciated. HaHa Hamden feat. Darren Sechrist and more! 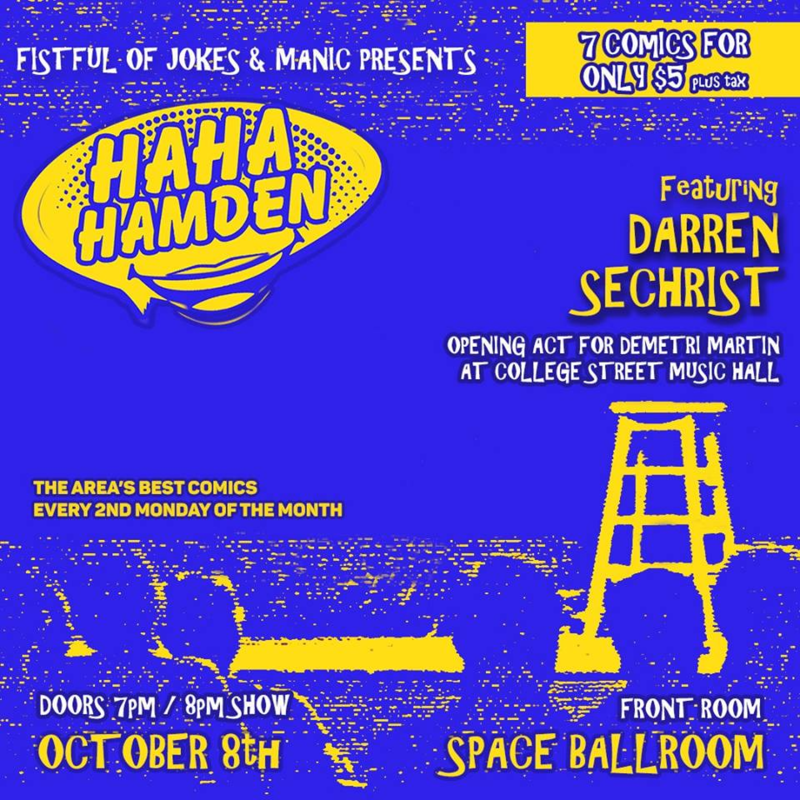 INFO: Darren Sechrist is one of New England’s top comics. Clean but subversive, insightful yet idiotic, Darren’s comedy is a hilarious mix of contradictions. Sound impossible? See him for yourself to find out. He has performed at clubs and theaters across New England and New York, including: Comic Strip Live, the Funny Bone, the Comedy Connection, and Comix. Along the way, Darren has shared the stage with top comics such as Demetri Martin, Henry Phillips, Joe Machi, Alingon Mitra, and Sean Donnelly. A Hawk and A Hacksaw (ft. Jeremy Barnes of Neutral Milk Hotel) w/ Elison Jackson and Lil Sluggers. INFO: A Hawk and A Hacksaw began in 2000 in the small town of Saumur, France. 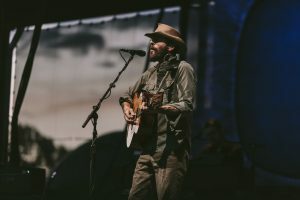 Initially a solo vehicle for Neutral Milk Hotel drummer Jeremy Barnes, the main impetus of the project was to focus on the gray areas in borders of music and geography. The first album was released in 2002 by Cloud Recordings. Barnes met violinist Heather Trost in 2004 and the band became a duo. 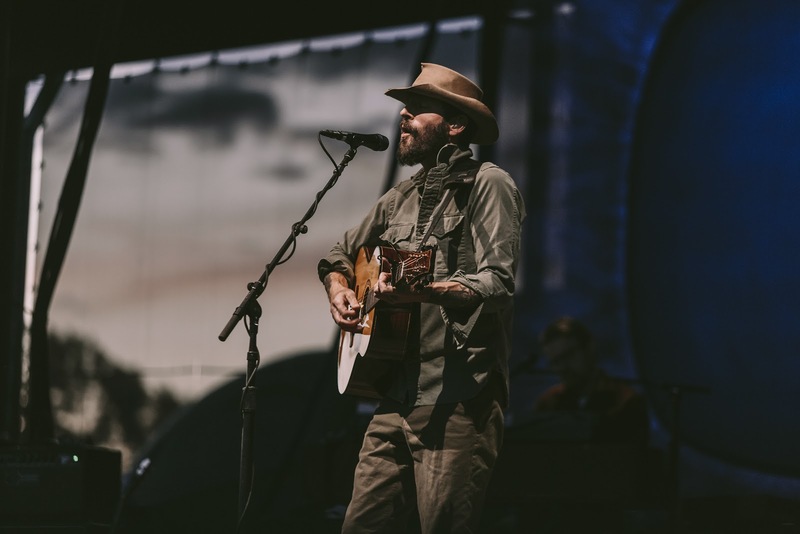 The pair has since released six albums, and toured extensively around the world. They have learned from and collaborated with some of the great musicians of Romania, Hungary, Bulgaria and Turkey. The duo has been invited to tour with Swans, Calexico, Wilco, Andrew Bird, Portishead, Of Montreal and performed at Roskilde, Pitchfork Music Fest, and All Tomorrow’s Parties. They also collaborated with Iggy Pop on the reworking of a classic sea shanty. The duo play nearly every instrument, but have some wonderful guest musicians on a few tracks- Turkish clarinetist Cüneyt Sepetçi, Hungarian cimbalom master Unger Balász, Chicago trumpeter Sam Johnson, who often tours with the group, Deerhoof guitarist John Dieterich, and New Mexico bassist Noah Martinez of the band Lone Piñon. INFO: Shakedown is a Connecticut based band that has been performing their unique version of a Grateful Dead Concert since 1987. Shakedown features wonderful three part harmonies with varied and interesting jams that reflect the band members’ special chemistry. 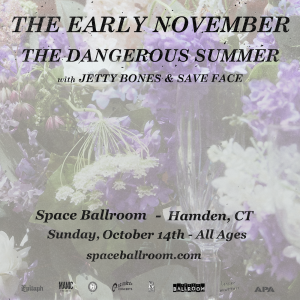 A loyal following of fans has blossomed over the years, and Shakedown performs regularly at Toad’s Place in New Haven and at almost every major music venue in Southern New England. They also perform yearly at StrangeCreek Campout and Wormtown Music Festival. Shakedown has been awarded winners of the CTNOW Music Award as the “Best Tribute Band” in Connecticut multiple times. 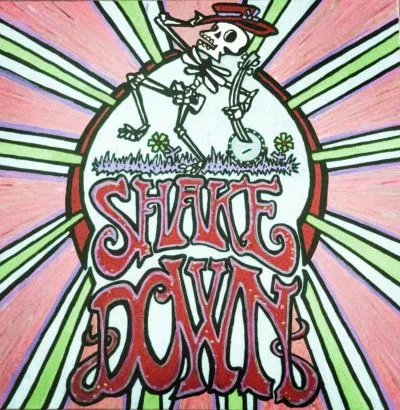 From “Truckin” to “Touch of Grey,” Shakedown will make you dance till you drop!